We havn't found any Picture Quotes by Herbert Paul Brooks Jr.
Herbert Paul Brooks Jr. was born in Saint Paul, Minnesota, USA. He was an American ice hockey player and coach. 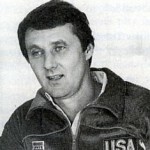 His most notable achievement came in 1980 as head coach of the gold medal-winning U.S. Olympic hockey team at Lake Placid. Brooks would go on to coach multiple NHL teams, as well as the French hockey team at the 1998 Winter Olympics, and ultimately returned to coach the US men's team to a silver medal at the 2002 games in Salt Lake City. He was a member of the 1960 Olympic team, only to become the last cut the week before the Games started. From 1960 to 1970, he set a record by playing on a total of eight US National and Olympic teams, including the 1964 and 1968 Olympic squads. He finished his collegiate coaching with a record of 175 wins, 101 losses and 20 ties.